Bright and Airy Oceanfront Beach House! Contemporary, 3 bedroom, 1 bath, open concept, oceanfront beach house. Listen to the ocean waves lap against the shore in this beautiful oceanside beach house. 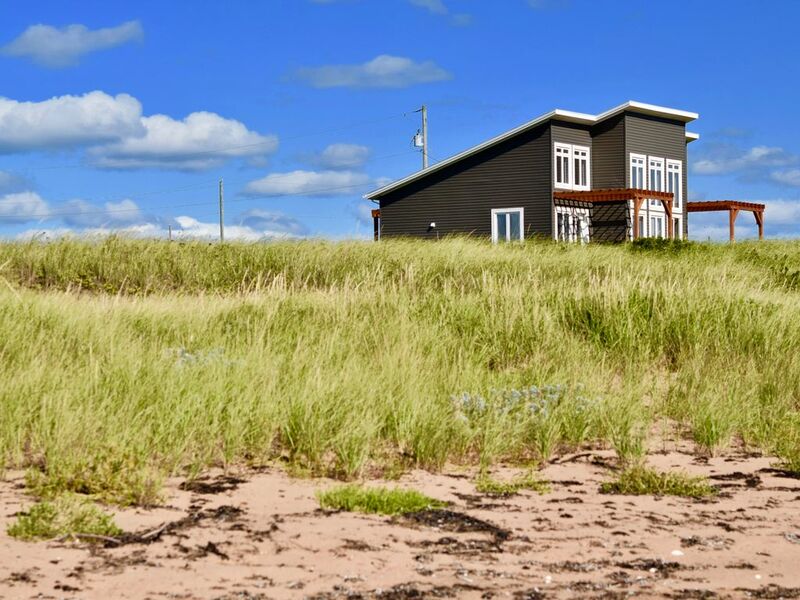 Located in the quiet and serene community of Belle River, PEI, this airy, bright, and well appointed vacation home awaits your arrival. It offers bright, spacious living areas, 150 feet of ocean frontage, and is situated on 2 acres of manicured lawn, affording plenty of room for outdoor play for children and adults, alike. The quiet, sandy beach is just steps from the beach house deck, with expansive hard packed sandbars at low tide, perfect for clam digging, building sand castles, beach combing, or just a relaxing stroll. The kitchen, dining room, living room and master bedroom offer 16 feet of stunning floor to ceiling windows, perfect for spotting seals and watching coastal birds dive for a fresh catch. Views from the beach house are filled with an ever changing backdrop of sea and sky--sparkling water, magnificent sunsets, starry skies, and moonlit ocean waves. At the end of the day, crawl into your dreamy white bedding, and let the rhythmic ocean sounds and gentle sea breeze lull you to sleep. My roots and heart are in Prince Edward Island. My grandfather was Angus Murchison, the keeper of the famous Point Prim lighthouse, just 20 min away from Sunshine Beach House. I spent my summers on the South Shore of PEI, exploring the beaches and countryside with my family, friends and cousins. As an adult, I had the privilege of duplicating this experience with my husband, Jerry, our four children, and two grandchildren. The South Shore of Prince Edward Island is now part of all of our hearts. The magic and adventure of these red sandy shores at once enlivens and calms our souls. The people here are genuine, funny, and kind. Simply put, it's my favourite place to be, and my favourite thing to do is to share it with others. We purchased our family cottage just a few cottages down from Sunshine Beach House back in 2009. We love the area so much, that we jumped at the chance to purchase Sunshine, when it hit the market in the spring of 2018. Already owning a cottage in this community, my husband, Jerry, and I have loved meeting people over the years who visit and rent cottages in our area. It is nothing short of a dream come true to have a second beach house that we can now both enjoy ourselves and also share with travellers visiting the Island. Jerry and I cannot wait to meet new vacationers and do everything we can to make their stay one that's full of wonderful memories and beautiful PEI experiences. Sunshine Beach House is set in a quiet, serene community. In the peak of the summer, you can count the number of other people you see on the beach with one hand, if you see any at all. If you are looking for parks and attractions to visit, there are many on the Island, and most are just a nice scenic drive away. In our area, we are blessed with our gorgeous shores, red cliffs, expansive farm fields, and country side that is dotted with classic farm houses, barns, horses, cows, sheep, and flower gardens, not to mention the magnificent wild lupins that line the roadways all over the Island in the month of June. Everywhere you turn, it seems, is a photo opportunity. There are lovely restaurants, wineries, mini mills, country stores, gift shops, farmers markets, and lovely harbour towns all within a 20 minute drive of Sunshine Beach House. Sunshine is definitely the place to be, if you want to step out for a little adventure and then return home to utter peace and tranquility. Electric heat in every room. Fresh, clean quality bedding provided, as well as cozy throws. Full size front-loading washer. Laundry pods provided. Lovely propane fireplace with beach stone fire bed. Plush, fresh towels and washcloths provided. A starter supply of toilet paper is also provided. Bell Aliant High Speed Internet service. Propane fireplace; overstuffed sectional with large ottoman & two slipper chairs; cozy throws for cuddling on the couch; wall mounted HD TV & DVD player; satellite dish; ceiling fan. Automatic drip, manual and electric coffee bean grinders, French press, cream and sugar dishes, & coffee stir spoons. Dish cloths and towels, pot holders, as well as a starter supply of paper towels, dish soap, dishwasher pods, spray cleaner, napkins, salt, pepper, coffee filters, and more. Pots and pans, lobster pot & tools, cutlery, cooking utensils, plates, bowls, serving pieces, drinking glasses & mugs, wine glasses, and teapot. Open concept, fully equipped kitchen. Dining area with seating for six people. Child's booster seat available on-site. Dining table with ocean views that seats six people. Child's booster chair available on site. Wall mounted HD TV and satellite service. Variety of genres, children and adult alike. Family friendly board games; toy selection for children. Children's beach toys, shovel and buckets for clam digging, life jackets for children's safety, beach chairs, beach towels. Selection of DVD movies for your entertainment. Two acres of manicured lawn--a perfect place to play for children and adults alike. 40 foot deck with 2 pergolas, which offer shading from the mid day sun. Propane BBQ with utensils and tools. Patio seating--table with seating for 6 and 2 lounge chairs. Outdoor shower. Belfast Highland Greens--10 minutes Brudenell and Dundarave--30 minutes Fox Meadow--30 minutes Links at Crowbush Cove--50 minutes.